Enjoy the drama, tension, skill and magic of tennis enhanced by a private helicopter. Witness first hand thundering baseline serves and nail-biting rallies at your chosen tennis tournament, with the crowd gasping as one united, captivated body. Flying to tennis events by helicopter gives you the added bonus of enabling you to escape the traffic chaos which accompanies such matches. Enjoy the drama, tension, skill and magic of tennis with a private helicopter transporting you to a special day watching live matches. Arrive in style, to experience first hand and close up the athletic ability of the tennis stars. Feel part of the tennis tournament by being at the match, relaxing with a glass of Pimm’s or champagne, knowing that you will not be driving home. Arrive refreshed at the start the day having been collected from near your home or office, before being whisked away, flying over the queues of traffic. Travelling by helicopter, in comfort and luxury; it’s the only way to travel. You will avoid the traffic queues that detract from the special treat of watching live tennis. Flexible travel arrangements are catered for with a helicopter charter, so you will not have to miss watching thrilling match points as games become epic on-court battles, just because your transport is about to leave. Experience the buzz of the crowd and stay until the players leave the court. You will be able to linger, even if rain stopped play and matches over run, as your helicopter will wait for the match to finish, so you will have no concerns about how to get home. Relax safe in the knowledge that you will not be left stranded if you choose not to miss the end of the match. You will be there to enjoy all the special moments and therefore return home with memories of a great day. Soak up the atmosphere of one of the world’s greatest iconic sporting events, Wimbledon. Experience the passion and tradition of the illustrious Wimbledon competition. Relax safe in the knowledge that by flying home, you will escape the inevitable traffic jams that would distract from a fantastic day out. The Wimbledon Championships always provide a magnificent festival of tennis and attract a huge crowd, based on the form and popularity of previous events. Wimbledon never fails to deliver great matches for tennis fans to enjoy. Arguably the most famous tennis tournament in the world, you would be disappointed to miss any games owing to being stuck in lengthy traffic jams. Using a helicopter means you will arrive in time to settle down to watch the on court action at Wimbledon and stay until the last player has left the court for the day and all the strawberries have been eaten! A selection of dates for some of the prestigious tennis tournaments are listed below, which tennis fans may like to put into their diaries. However, we will be more than happy to fly you to other tennis events, such as Davis Cup matches. We also offer tennis hospitality packages for those wishing to use tennis matches for corporate hospitatlity. 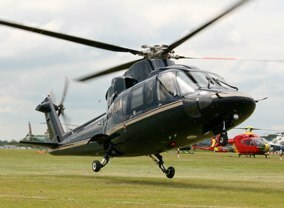 To book your private helicopter flight to a tennis event, including Wimbledon or to ask about our tennis hospitality packages please call our team now on 01256 635000.